Giant Double Helix Made Of People! ofpaperandponies:newdaynewtruth:effyocouch: A picture from my work on 4-21-2011. I helped to organize this Guinness world record event. 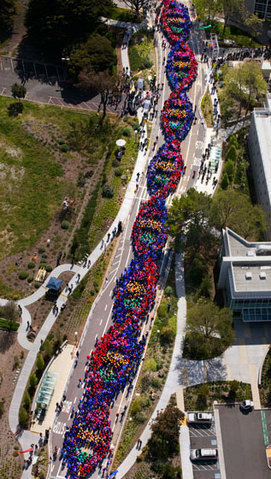 More than 2,800 people from my company took over a street in South San Francisco, and made a dna helix chain all the way down. Yes, the helix is made entirely of people! This is a helicopter view. Enjoy. Giant double-helix clogging up a major thoroughfare? Must be Thursday. This *so* satisfies the biology geek in me.